Building a new home or commercial space is easier and faster with proven site preparation and demolition services from TCF. TCF demolishes retail spaces, office buildings, homes, and other properties upon request. Our team of laborers uses top-of-the-line excavators, containers, and Bobcats™ for a job well done. We take great pride in our work and it shows in our craftsmanship. You won’t find another demolition contractor as excited as we are about exceeding your expectations and building a relationship with you that lasts a lifetime. TCF provides customized service at affordable rates. Each site is treated individually and we employ only the most suitable methods and top quality equipment to get the work done quickly and safely. Our years of experience allow us to provide the safest and most efficient demolition services. TCF has the experience and knowledge to prepare your property for new construction and we haul the debris away from your property giving you the perfect canvas for your next project. 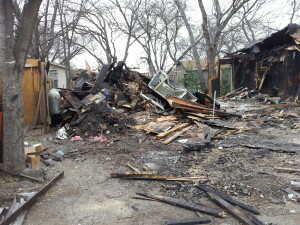 Hire us today for anything from home demolition and trash removal to debris hauling. The environment is important and we take responsibility as a demolition and deconstruction business to recycle, donate or reuse and re-purpose much of the materials we remove from a project. We excel in meeting and exceeding environmental standards set forth by the state of Texas and each individual county.